Assigning modules from a library to a server where the amount of modules can change? I need to create a design for an internal tool that we will try to utilize within our own team that works with software testing. We will try to build a tool that can help us automatically setup a test system. I have a list of servers that I want to add multiple modules to. I want to set a number on each module so it will be instantiated that many times in the server. I want to pick the modules from a library of modules displayed to the user. Is it possible to combine drag and drop from the library to the server and at the same time apply the number of that specific module I want. 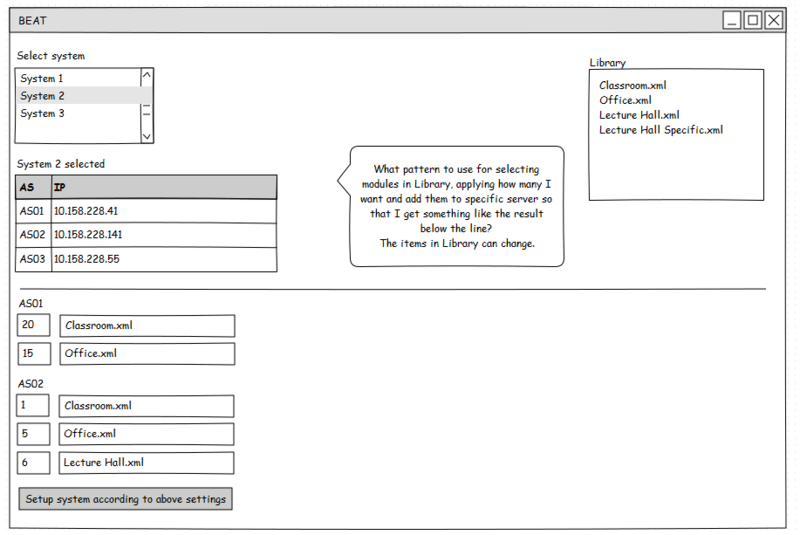 Please see attached wireframe. I've been wondering about the explanation, as the end-result is "i want to emulate a certain amount of certain entities", everything else (server list, ip-addresses, ...) seems clutter... my suggestion would be a list of entities and an amount, the backend should than take care that they are created in this pool of servers. Where do I place the interface to change default form values, where such interface is restricted to certain users?